Praha Main Train Station © 2005 by Jean-François BODART. Reproduced by permission of the author. Sometimes our notes are free-form and flowing and no two notes look much like the other. Some notes, though, need to adhere to a more rigid format because they always contain the same key bits of information. Telephone message pads, receipts, and library call slips all look alike because, at some level, they all are alike. 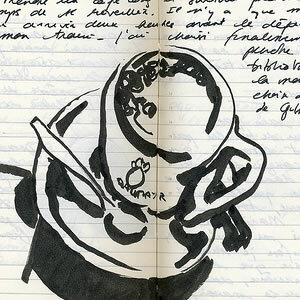 Notebooks themselves may be formal or informal. A patrol officer's book of traffic tickets is formal; each ticket that is written can easily be entered into a database, and that database may easily be designed to anticipate every kind of traffic violation, the documentation it requires and the action needed for disposition. A detective's notebook, on the other hand, may need to contain a great deal of unpredictable and informal material: the statements of witnesses, impressions of the crime scene, background notes on the location of the crime and its victims, details on the business normally transacted at that place. Detectives can't take formal notes, at least not initially, since it may not be immediately clear exactly what needs to be investigated or whether an investigation in required at all. Often, informal notes need to acquire more formality over time. In the course of investigation or research, some names and places will prove central. It's useful to be consistent when referring to these key actors, so we (or our agents) can easily locate references to them. Often, we write informal notes and later revisit them as needed to annotate and clarify. This step is, in effect, gradual or incremental formalization. 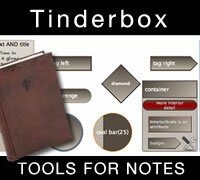 The gradual discovery and use of Tinderbox prototypes is an additional example of incremental formalization. In a new project, we may well wish to avoid an encumbrance of prototypes and simply get down to the business of taking notes. Later, we may find that adding a few prototypes can help avoid repetitive typing, and so come to rely on prototypes more heavily. Ultimately, we may find that all the notes in a context should share a prototype, in which case we can use actions, agents, or rules to set prototypes automatically.